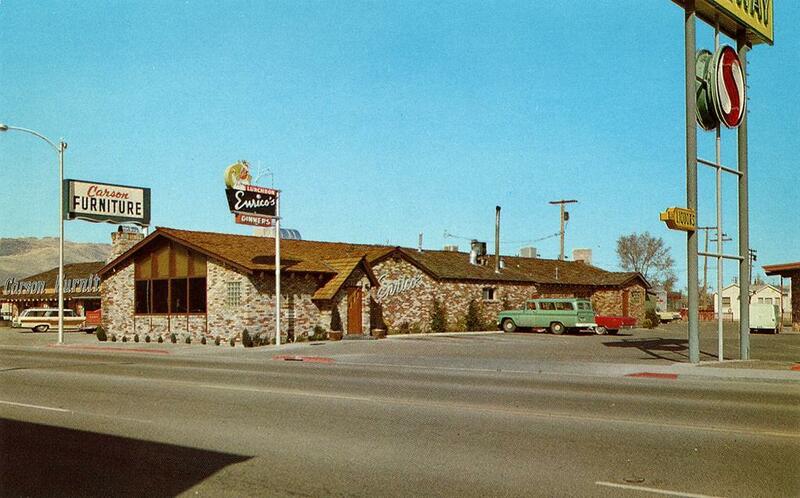 In the 1960s Enrico’s Dinner House occupied this spot on North Carson Street. I’ve never been able to find much information on Enrico’s, but they served lunch and dinner, and from the lack of windows it seems like it would be pretty dark inside. Smoky too, probably. Next door is Carson Furniture, with a wood-paneled station wagon parked out front. I wonder what they could be buying? Out of frame to the right is the Carson City Safeway; a little bit of the rock wall can be seen, but enough of the sign is visible to see the distinctive S logo. This photo was taken from the base of the Frontier Motel sign across the street. In some ways, not much has changed in 40 years. But, really, everything has. All three businesses that were in the old postcard are gone. Enrico’s closed decades ago. Carson Furniture moved to the far north end of town, next to Mi Casa Too. There it stayed until it merged with Winan’s in 1995, then went bankrupt ten years later. And Safeway moved too, just a few blocks north where it is still open today. New businesses arrived to replace the old, though, and all three buildings are still occupied today. 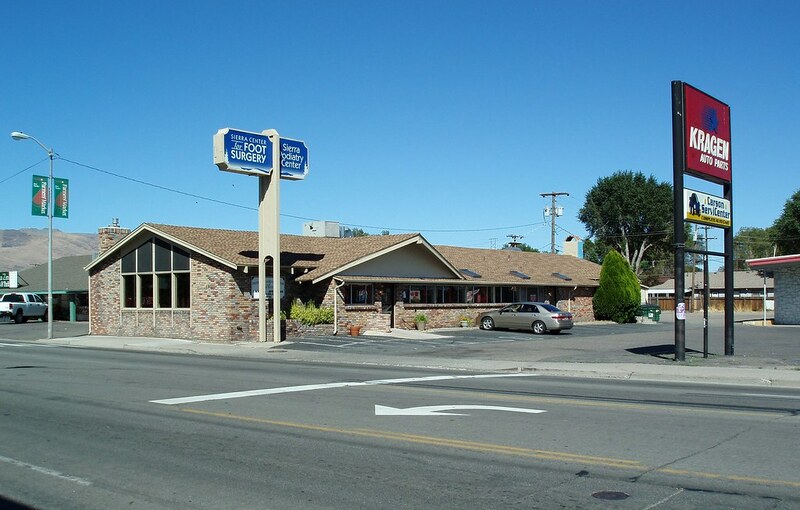 Enrico’s restaurant is now home to a foot doctor, the Sierra Podiatry Center. The entire back of the building is taken up with a mural celebrating bicycling in Carson City, and Glenn Lucky in particular. Carson Furniture has been split into smaller retail spaces, and has housed a thrift store, a book store, and a solar panel dealer. And the Safeway building, which still sits out of frame in the “now”, is home to Kragen Auto Parts, formerly Grand Auto. The sign still exists, though it looks like it’s been sawed off. And the tree in the distance behind the sign still exists too, showing 40 years of growth. Thanks to Dam Zampirro for sending in this Then and Now, and for taking the “now” picture. according to Polk’s Carson City Directory 1964 Enrico Dinners was owned/or operated by Harry Ramirez. It was a favorite watering hole at the time. Prior to Enrico’s (and I was a neighbor of the Ramirez family on Richmond Street) this was my Uncle John Savage’s construction company site. He moved the company in early 1960s to the current site of Meeks and the office buildings on the corner of Nye and US395. If I can find any pictures of these I will get them posted. I ate at Enrico’s many times during my youth in Carson City, primarily because my step-father was the bartender at Enrico’s for several years at one of the nicest bars in Carson City which was frequented by the middle and upper-class imbibers of Carson. The decor was upscale, clean, and pleasant. Focusing on steak and seafood, the menu was extensive with tasty appetizers, large entree portions, and good desserts, all served by cheerful and competent waiters. Harry Ramirez was a genial host and generally a nice guy. At its peak, Enrico’s was the nicest steakhouse in Carson City. Teddy Chew’s Golden Dragon restaurant was in the back half for a while. My mother was a waitress for him. I would go there after school to have dinner before I went to work at the Hudson gas station. Mother could only afford pork noodles, the cheapest dish. The cooks hated it as it was back luck to have the first dish of the day be the cheapest. Now Kragen Auto has become O’Reilly Auto Parts…The North Carson Safeway has closed, and is now a Cal Ranch Store.